"Citations for Bronze Star Medal: Coy E. Cates, Private, Company D, 16th Infantry. For heroic achievement in connection with military operations against the enemy in the vicinity of La Chappelle, Normandy, France, 28 July 1944. When his company's advance was impeded by heavy enemy machine-gun and mortar fire and a number of men were wounded, Private Cates fearlessly proceeded across open terrain, administered first aid, and removed a seriously wounded comrade to a position of safety. Private Cates' heroic actions exemplify the finest traditions of the Service. Residence at enlistment: England Arkansas." 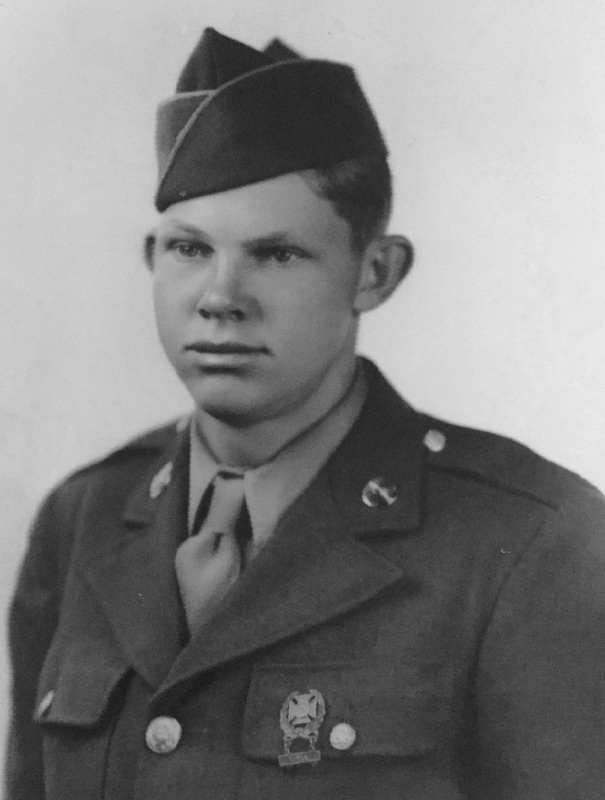 The above summation of Coy E. Cates' participation in WWII is an example of how he lived his life, in the service of his family and friends. Coy moved to Lakewood, CA in April of 1953 to enjoy a different lifestyle and work at the Ford plant on Terminal Island in Long Beach (retired in 1980). Coy and his wife Helen were active members of their community, including their church. They raised two children--David and Barbara--who attended and graduated from Lakewood High school (c/o 66, 68 respectively). As time passed the family grew as Barbara (John) and David (Mary June) both married. Both siblings had children (Barbara-Becky and John Paul; David-Neal and Stephanie) who continue the traditions of being active members of their communities throughout Southern California. After a long, event-filled life, our hero went home to be with the Lord on June 23, 2005. Coy is survived by his wife, Helen, his children (David, Barbara), four grandchildren [Becky (Doug), Neal (Elisabeth), John Paul, and Stephanie (Kenneth)], and six great-grandchildren (Alyssa, Brianna, Courtney, Skylar, Ella, and Olivia). Coy continues to be an inspiration as a father, grandfather, great-grandfather, citizen, and soldier. .